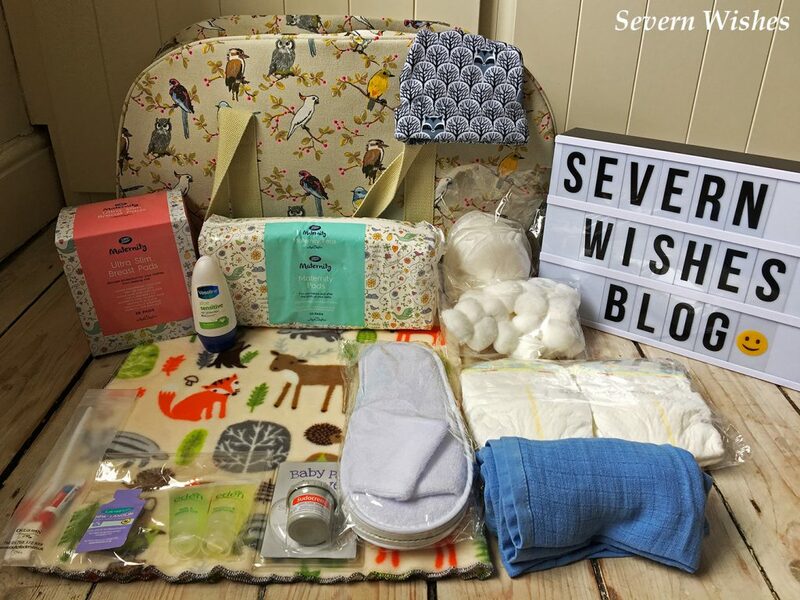 As the due date of my little one was fast approaching I had begun to compile my items for my hospital bag. I had done a lot of research because I didn’t want to be bringing anything unnecessary, and I also didn’t want to forget something either that I could have otherwise over looked being a first time mum. One thing I knew that I wanted was a nice blanket to wrap our baby in. My husband and I wanted to personally choose a nice outfit to bring baby home in too. And other than the usual necessities of a hospital stay, I was clueless as to what other items I may need for baby. When you sign up to various baby things you will undoubtedly get a list or two about what you do and don’t need for hospital. Of course every couple is different and you also have to consider the time of year too. The best ones we found were the Bounty one and also one that we had at a Mothercare baby event. Louise Said; “We used two separate bags for convenience. Consider that you might be in labour or in hospital for a while, so headphones, a book or magazine might be a good idea. Don’t forget to have a car seat ready for when you go home as the hospital need to see you with it when you leave with your baby”. The image above shows all of the items that I got inside the bag that I ordered from “Goodies 4 Mummies Pre Packed Maternity Hospital Bags”. I wanted a new bag specifically for going into hospital, but one large enough to put everything inside. I did not want to carrying multiple things because they wouldn’t fit. I contacted this page via their Facebook messenger section and discussed what I needed. In the end I chose this gorgeous bird design bag. The contents you see were all included, and most of it is excellent quality. You can choose whether you need a specific gender of items or neutral. We already knew we were having a little boy so I chose the blue. This included a Muslin Cloth and a Hat that were blue in colour. I would rate the bag and the contents a 5/5 for range and quality. I would rate the service of this business a 5/5 as well, fast delivery too! The one thing I had read online that my mind hadn’t even considered was a pair of disposable slippers for the ward and (because I was having a summer baby) a portable fan. The slippers were luckily included in the Maternity Bag that I had ordered. Our son decided to make an entrance into the world on one of the warmest days of the summer so far. It was 30 degrees Celsius in the delivery suite room. It was at that moment I was so happy that I had purchased a portable fan! This fan was only £11 on Amazon at the time I ordered it. The device can be charged up via a USB cable and then runs on a full charge for approximately 10 hours. With 3 speed settings as well it was rather handy. 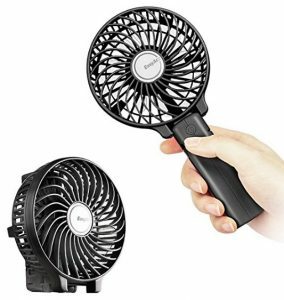 The fan has a fold-able handle that is situated at the back when not in use. Ideal size for holding and for transporting, and in my opinion not that heavy either. I would review this item as a 5/5 considering the price and convenience of it, it was used throughout my labour during the day and night, my lovely mum was in charge of holding it over me, and a great job she did too. Here is the link below if anyone is interested in purchasing one. Knowing that we also got an opportunity to have a photograph taken of our baby by the hospital Bounty Photographer, meant that I wanted it to be memorable. They suggest a tiny soft toy, blanket or comforter to be in this photo. My husband and I have decided a comforter with a soft toy attached, and a spare blanket are the right things to take with us. Although you can bring almost anything you can think of. Here is a final list of exactly what I have put into my hospital bags. I eventually did one for our baby and one for me. Just so that it was easier to find items for either person on the day or days that followed in hospital. It turned out to be a very good idea too! Here is the final list of exactly what I have put into the bag for our newborn baby. We ended up being in hospital for 4 days first of all after my sons birth. I was very lucky that my husband was able to go home and collect items for me including spare muslin cloths, spare outfits for baby and he also had to go out and buy some tiny baby clothes too after our little one lost some weight. You are always better to have more than you need than not enough. I would say it’s a good idea to bring several outfits with you because you don’t actually know the size of your baby until they arrive. And the majority of babies lose weight in the first couple of days as well. Be prepared! Here is the final list of everything that went into my Hospital Bag. This key will identify to you whether or not I used the item or I didn’t. After this list I will be briefly outlining what my most used items were and what I definitely couldn’t have been without. Overall there was very little that I didn’t use out of my bag. And what I didn’t was usually down to the hospital providing the items for me, such as towels for showering etc. Sometimes you would of course prefer to use your own which is understandable. 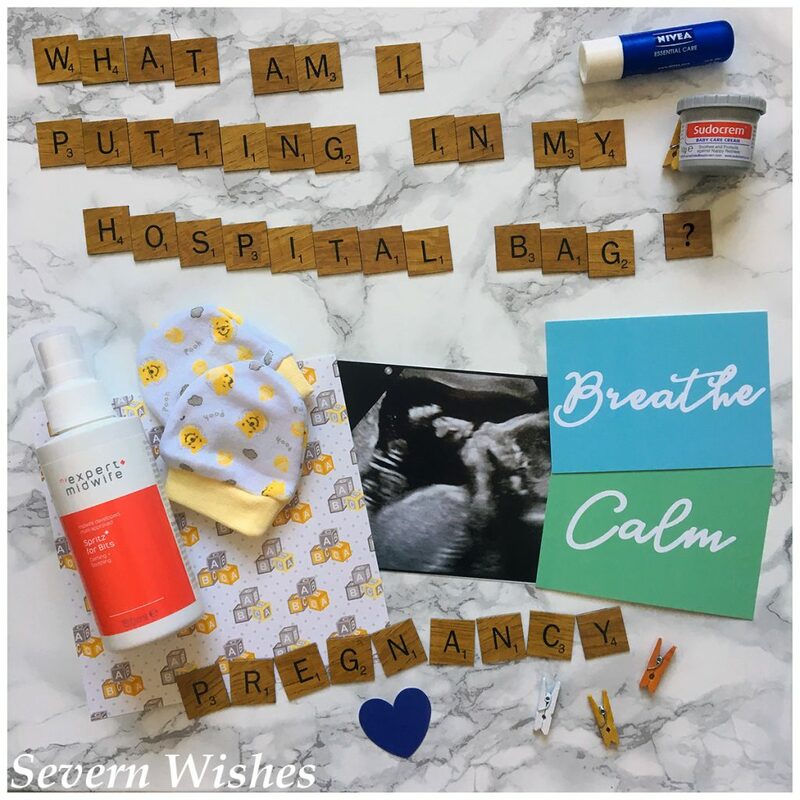 Some things such as the Spray Bottle for Water I was recommended by so many lists to take with me, to spray water on to my body while hot in labour, and to spray on sensitive and swollen areas after to cool myself down. However it was forgotten all about during my labour which progressed quite quickly. There were a few items I couldn’t have done without. The disposable slippers for one, a godsend on a busy ward recovering from birth. Another thing was the lip balm, you won’t believe how dry your lips get in that environment. And also the isotonic drinks I had brought with me were an excellent choice, and I have my midwife to thank for their recommendation. I will be reviewing the My Expert Midwife items in a separate blog post. Thank you very much for reading this blog post today. I hope you have found it interesting and I have to say I cannot believe I’ve brought this post to you after baby is born. He was definitely in a hurry to meet everyone. However it’s exciting! Thanks to my friends who contributed their ideas to this post and thanks to everyone for their patience while I adjusted to life as a new mum! 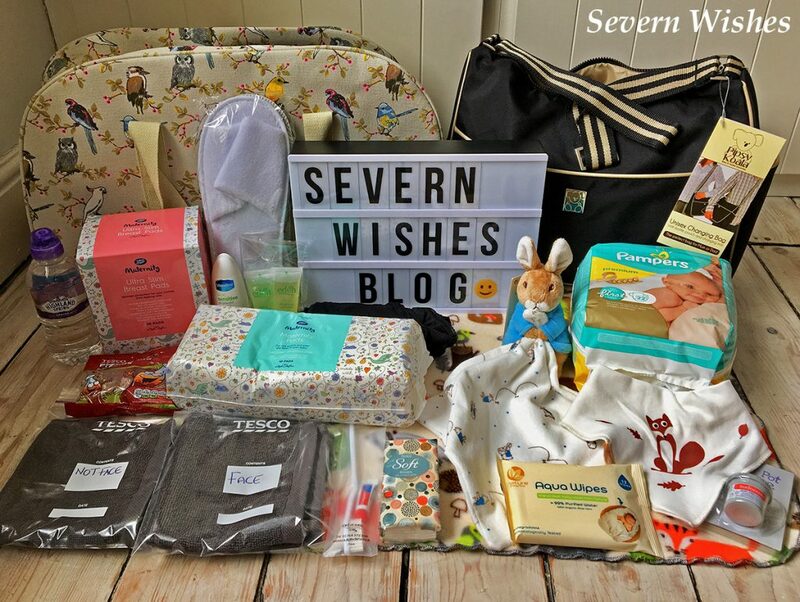 Come back soon to Severn Wishes for Reviews and Lifestyle!